Over the past few weeks I’ve been working through Michael Heiser’s The Jewish Trinity and posting snippets as I go, but in this post I will give some concluding thoughts and review the whole enchilada. I’m working through Heiser’s The Jewish Trinity (other posts) Logos Mobile Ed course. Having laid a foundation that monotheism is compatible with divine plurality, Heiser now turns to argue for plurality within Yahweh Himself. Heiser claims that Judaism once believed in a Godhead, but rejected the doctrine as heretical late in the first century, in response to the claims of Christianity. For many (including myself) this no doubt comes as a shock. I’m working through Heiser’s The Jewish Trinity (other posts) Logos Mobile Ed course. So far Heiser argued that the Old Testament teaches the existence of multiple elohim (“gods”) and that this is not incompatible with monotheism. 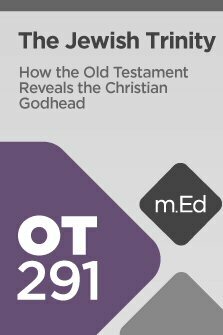 Recognizing divine plurality in the OT is one step closer to recognizing plurality within God Himself, which sets a foundation for the NT doctrine of the Trinity. We’re working our way through Michael Heiser’s Logos Mobile Ed Course The Jewish Trinity (other posts). One major step in Heiser’s argument is in explaining that the Old Testament teaches a council made up of Yahweh and other elohim, otherwise known as the divine council. It may be surprising to many that such an idea is found in the Scriptures, but for Heiser this neglected truth can assist in Jewish evangelism. Recognizing divine plurality in the OT helps clear the ground for plurality within YHWH Himself. How Do I Respond to a Jewish Objection to the Trinity? Central to Judaism is monotheism: the belief in only one God. Christians claim to hold this belief too, but sometimes are accused of inconsistency with our doctrine of the Trinity. Can God be one but three? However, what if the Old Testament itself teaches divine plurality? I’m beginning a review series on Michael Heiser’s The Jewish Trinity Mobile Ed course. This is my second course so far, but I reviewed the first as an overview of Mobile Ed itself. With The Jewish Trinity, I will focus more on the content as I work through it.